Total silence this night. No whistling wind, no roaring river, no singing birds. The Tussock seems to absorb all the sounds. Nothing to hear at all. Quite amazing. I'm laying in my tent, waiting for the first of the forecasted drops to hit my tent, breaking the silence - but there are none. 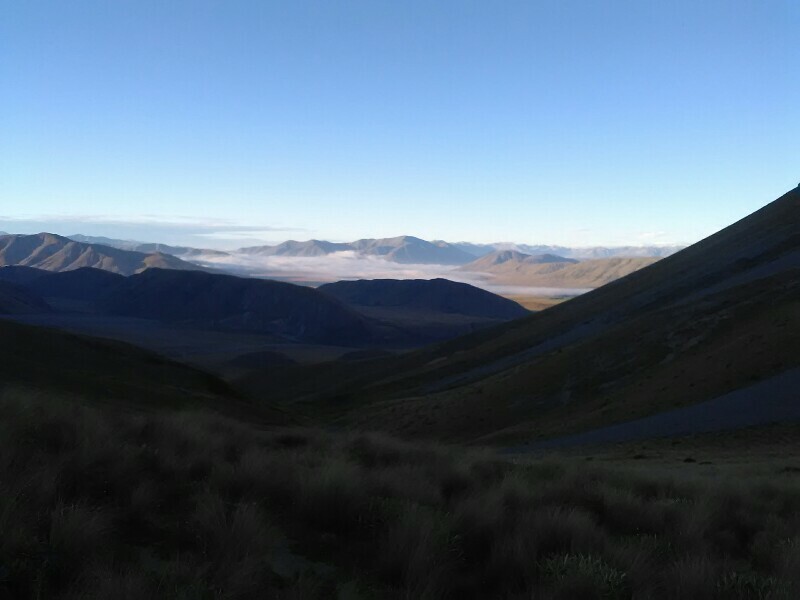 To my surprise, the sky is clear, with only some clouds far down in the wide valley when I crawl out of my tent. So I continue my descent through dry Tussocks. It's still early, my brain not yet fully operational and thus it doesn't take long until I get lost in the thick Tussock and end up bunch of spiky spaniards. Oh man, I already hate them so much - after only two days. Eventually I spot marker pole and back I am on the track. Maori Lakes, are located along the gravel road and are a pleasant, well located place for my lunch break. If it wasn't for the wind that is picking up... Despite the sun, it gets uncomfortably chilly and I see myself forced to shorten my break. I continue along yet another easygoing Clearwater Track, where I meet my first true NOBO (hiker tramping from Bluff northbound), a Japanese guy. Day 43 for him. Including 5 rest days. Gives me a rough estimate how long it's still going take me. There are no huts on today's last section but plenty of suitable camp spots, so it's basically gonns be walk until I drop. After the long hike yesterday, this happens quite early, just before a saddle, close to a tarn. The location is reasonably sheltered from the wind and offers some nice views of the surrounding mountains. 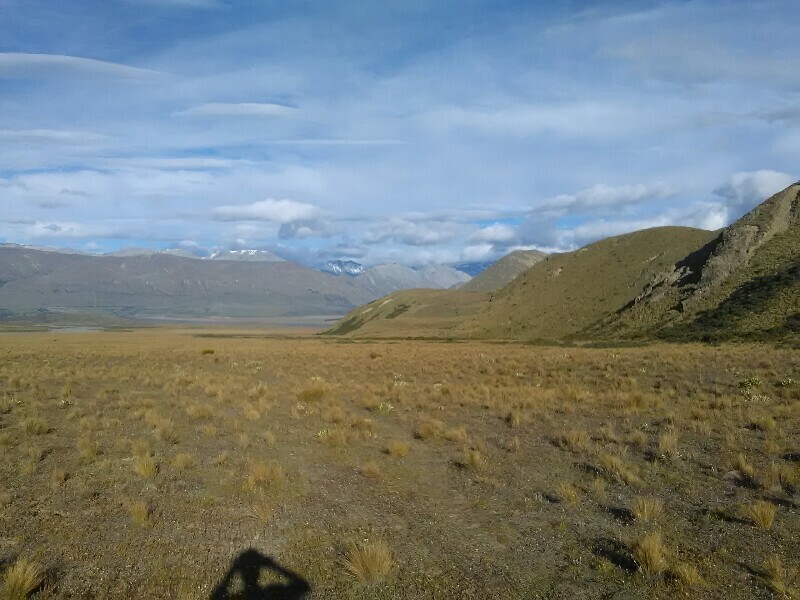 Thanks to yesterday's good progress, I'm in a reasonable position to reach Potts Bridge at Rangitata River well before noon, which should make it fairly realistic to hitch a ride to Peel forest tomorrow. New Year's Eve is an unspectacular affair in my tent. I enjoy the quiteness. No fireworks, no drunken people. Just the wind rocking my tent. Down on the flat. Easy, fast going. What a great way to end the 2016. Happy new year Sandro.